What To Do If Your Photos or Videos Do Not Have an Exif Date Created? When you are using PhotoMove there can be times when you’ll find that the folder or folders you are processing contain a mixture of files with valid exif creation dates and some without. In order to make it easy handle these no exif date files PhotoMove now includes three different options. 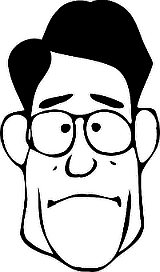 Check the ‘Use File Date to Move or Copy to Structured Folders’ check box. PhotoMove will use the date of the file to move or copy it to your new folder structure based on that date. Check the ‘Copy or Move to This Folder’ check box. 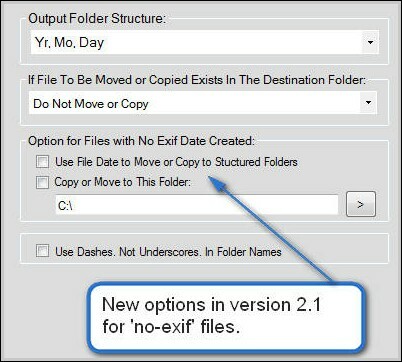 Then set the folder where you want the non exif date files to be copied or moved to. Leave both boxes unchecked. If neither is selected PhotoMove will leave any no exif date files in the original location and will not move or copy them.